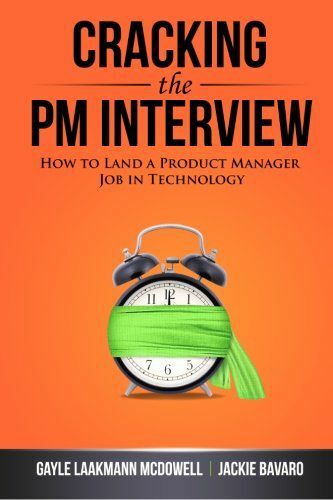 Next on our series of product management books series: Cracking the PM interview. This guide by Gayle Laakmann McDowell and Jackie Bavaro’s is a great resource for aspiring product managers. The book starts with a brief – yet comprehensive – definition of what product management is and what are the main functions of the typical product manager. There’s also a particularly useful section where the authors disprove the “top myths about product management” such as the misconception that product managers are project managers; or the confusion generated by the job title that leads some people to believe that product management is a marketing function. Next, Laakmann McDowell and Bavaro describe the responsibilities of product managers in companies such as Google, Twitter, Apple or Microsoft, as well as in startups. You won’t get to the interview if you don’t nail the resume first. Cracking the PM interview will guide you through the process of writing an effective resume that increases your chances of landing an interview. You’ll also find some “before and after” examples of actual resumes that were optimized following their advice. This is where the meat of the book is. You’ll get detailed advice on how to go through a product manager’s interview. Learn how to define yourself and answer behavioral, estimation, product, case, and coding questions. Cracking the PM interview also includes tips and tricks, samples, and solutions to help you practice and sail through the interview as if you did one every morning. Often times the best candidate is not hired because of a bad resume or interview. We believe that Laakmann McDowell and Bavaro have put together an excellent framework to let you show your capabilities to take on a product management position. If you’re an aspiring product manager, then this book is definite must read.